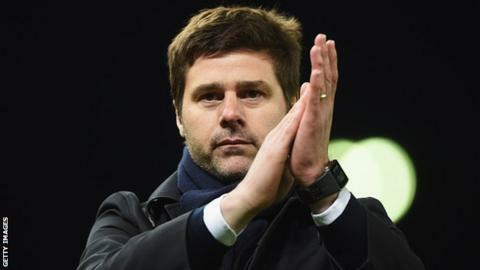 Tottenham manager Mauricio Pochettino has signed a contract extension which commits him to the club until 2021. The Argentine, 44, was appointed in May 2014 on a five-year deal and guided Spurs to a fifth-place finish in the Premier League and a League Cup final in his first season in charge. With one game to go, Spurs are guaranteed a top-three Premier League finish this season. "We believe this is just the beginning," said Pochettino. Quiet but ruthless - who is Pochettino? Spurs were challenging for the Premier League title until a bad-tempered 2-2 draw at Chelsea last week ensured Leicester City were crowned champions of England. Pochettino has created a fast and powerful side with a backbone of young English players such as striker Harry Kane, defender Eric Dier and midfielder Dele Alli, who have all received their first international caps during the Argentine's tenure. He was photographed having lunch with former Manchester United manager Sir Alex Ferguson this week, prompting rumours he could be a target for the Old Trafford team this summer. However, the former Paris St-Germain player believes he can bring trophies to Spurs. "We have a long-term project and huge belief that we can achieve something big here for the future," added Pochettino. Assistant head coach Jesus Perez, first team coach Miguel D'Agostino and first team goalkeeping coach Toni Jimenez have also agreed extensions to their contracts.